I have been in a relationship for 4 years now. You can probably imagine some of the things we've been through and the rollercoaster it has been. 1. Comfortability turns into apathy. So many times, couples who are comfortable like this eventually grow apart because they are so used to the routine of the relationship and they eventually stop caring. Darell and I have definitely been both of these types of comfortable, and now that we're getting older and more mature, we're learning and trying ways to be comfortable and explore our interests together and as individuals rather than growing to slowly not caring about the relationship at all. It is definitely easier to start growing apathetic than to start exploring and maintaining the relationship, but it is all on you and how much effort you both put in to get things going. 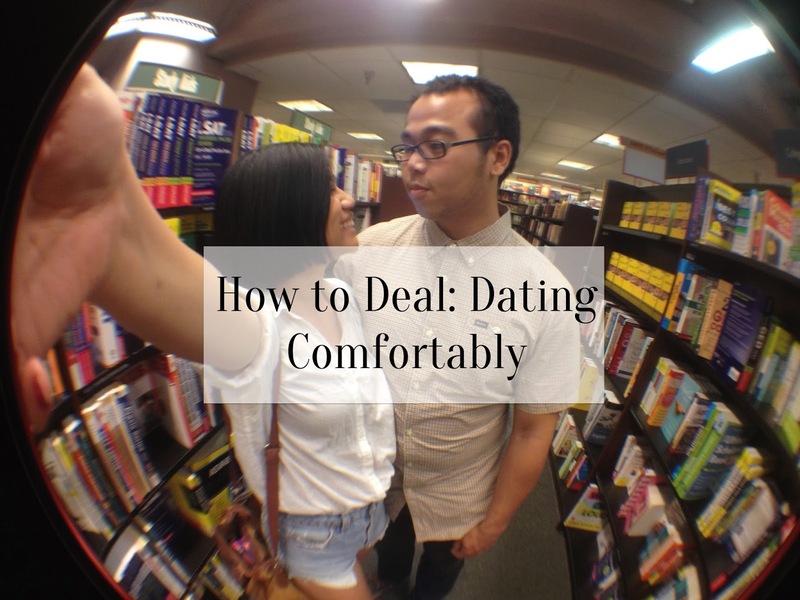 So, what are your best tips for when you are in the stage of being "comfortable" with your significant other? Has this stage ever been what led to the downfall of a past relationship? I'd love to hear your stories! I like the two perspectives of comfortability. I'll have to be honest and say that I've never been in a relationship where I've gotten comfortable. My longest relationship was long distance, so seeing each other every few weeks was exciting and refreshing. My second longest relationship wasn't comfortable because we fought a lot and so there was a lot of anxiety. I'm in my third longest relationship now (5 months "officially." Whoa. Go me.) And we've seem to hit what is going to be our comfortable stage. Seeing each other has become so routine that we usually see each other on the same days every week. We're both so busy with our schooling that we have to make a point to spend time with each other, so I think that's a way we fight comfortability. That's great, Nina! I hope that as you enter into this comfortable stage with your boyfriend that you guys use this time to explore how comfortable you guys are with each other and have some fun with it! You definitely don't want to get too comfortable and let your routine of seeing each other become meaningless. Good luck! I could not agree with you more. I think it really depends on the couple if they chose your route or the route of negative comfort. Does that make sense? If you and your partner are willing to put in the work and keep that interest alive, being comfortable is the best thing in the world. It leads to learning more about each other and challenging each other. I've been dating my boyfriend for two years now and we are very comfortable together. But we always try new things together and have good conversations where we will push each other to dive deeper. I think comfort gives you freedom to go deeper in your relationship. I love what you wrote. Thanks for sharing! Comfortability is something to be so careful of in relationships. You hit this perfectly! It's all about continual exploration and purposeful engagement with one another. Sometimes you have to try when you really might not want to, or when your favorite show is on, or when you just have stuff to do...but it's a must. Comfort turns into exploration is always so much fun. It's a great way to learn MORE about each other! I think comfort is key. If you start letting your mind turn it into a bad thing than it will be a downfall, but honestly feeling 100% like yourself around someone is the best thing. It doesn't always need to be a lightening storm of energy. Trust your love. I don't think being comfortable has ever ruined any of my past relationships.. if anything.. it's not being able to accept one another and not being able to get comfortable. My husband and I have definitely gone through both ways of being comfortable.. Lately we have been combating the apathy by learning to go on more creative dates and experience new things together to keep things fun and interesting. I really needed to read this! I have been with my boyfriend for a while now and I sometimes feel like we are too comfortable with each other and it has lead us to be in a rut. We need to go on dates and start doing new stuff together! I'm comfortable in my marriage but not too comfortable - when I feel like we've gotten too comfortable I do something to shake things up a bit! I haven't experienced this myself but it's great to keep in mind! being comfortable and being yourself is so important in a great relationship, at least that's my experience! This is definitely an interesting perspective. Thanks for sharing your insight! I definitely agree that being comfortable in a relationship can go either way. My husband and I like to try new things together when we feel like we've gotten too much into a routine. Lately there have been so many changes we are just dealing with those on a daily basis. I agree with you on all accounts. The man I eventually married is the man that I was most comfortable with. I never once felt like I had to mask or show something different. I am totally comfortable being with him in my dressups and in my sweats. I think that is why we fell in love so quickly, because it was never a show - it was a real relationship. This is a really interesting post and something that I've never really thought about before. Being comfortable in a relationship is important but I think it's risky that it could lead to complacency which is when lots of problems start. Although I am not in the dating scene anymore (thank goodness!) this was such a great post, and I definitely agree with your thoughts on being comfortable! This is all SO true! I love the idea of pushing each other to conquer new things and to get to know each other in new ways. I love being comfortable in my relationship. My husband and I frequently take time for date nights. Once you have kids, being alone as a couple is so important! I like these perspectives. I think in my relationship we go through waves too, we get too "comfortable" and then make an effort to reconnect. Being comfortable is definitely a nice feeling. But we like to make things more "exciting" by going on different fun excursions. In my case the comfortability (together with having a baby) led to the death of my marriage, via the other person cheating me first. It is a tough situation for a relationship and not everyone is ready to work for what they have. Great post! I have been with my husband for 9 years and I can most definitely say we are comfortable, but we push each other and grow together. You can imagine how much we have grown together, but it wouldn't have happened if we weren't pushing each other to go in that direction. We also like to try new things together, whether it is just going to new places to eat or traveling to places we both haven't been. It has worked out wonderful for us. Relationships are soooo tricky! And personalities have so much to do with everything that goes on! Fun post! This is a great observation. I think the moment we stop trying, is the moment we have already failed. I've actually stayed in relationship that wasn't good for me because I was so comfortable. I think you just have to continue to grow and challenge yourselves as a couple. I think you've got to create activities and experiences that push you to do this. Because we grow innately individually it's only right that we should also grow as in our relationships. If you stop then I think you have to discover why that is. Are you not spending time together? Are you holding back? Are you not in love anymore? Like everything worth having in life, relationships are hard work. So you've got to put in the work to be able to grow and offset getting too comfortable. Great perspectives. The comfort factor made my relationship better, for sure. I agree that it depends on the couple though. Ugh. Maybe you can give me advice for relationships... Ha! This guy... We broke up... But... It's weird. I dunno, it's too confusing over comment, HA HA HA! That comfortable stage, I see as a good and bad. I want to be comfortable with someone. I want to let my guard down and be able to have conversations on a different level. This won't happen if I am not comfortable with that person. But, in a relationship, we need to recognize when we are getting TOO comfortable. I try hard to make sure we get away with each other for a weekend trip at least once every three months. Works magic each and every time. This is a lovely post, Kriselle!! I love your thoughts on getting too comfortable in a relationship and finding ways to grow :) I married my boyfriend of 6 years this June and we've definitely been comfortable with each other for a while. But that doesn't mean that we're perfect-- not perfect at serving, loving, caring for, forgiving, and communicating. There are always ways to be better! I think it's important to become comfortable with one another relationships all start out awkward and uncomfortable. Getting comfortable means that you are growing together as a couple. But at the same time, it's important to keep things new, and fresh in the relationship. I don't think I'm comfortably married to my husband, we're still dating and I love the looks we give one another and the butterflies I still feel when we have a really nice night out, or if we're having a personal conversation about things. My mother in law gave me the advice to never stop dating (my husband), Dating is key to a successful relationship. I like your two outlooks. And I agree. Sometimes complete comfort can get boring. But it's nice to have that feeling of just knowing what to expect. I love to be comfortable. It makes it so you can be real, and you can pursue life as a team not new lovers. The newness is always so exciting, but knowing I have a companion to go through life with that knows me better than my best friends is so rewarding and amazing.